If you are fortunate enough to live in an area with an abundance of fruit trees, chances are there are an abundance of people who don't want to deal with the fruit of their tree's labors. They may be friends, neighbors, or a stranger living in another part of town. If you notice a fruit tree, full of ripe edible fruit in hoards on the branches and on the ground, it doesn't hurt to ask the owner if they would be willing to let you pick for them and split the harvest. 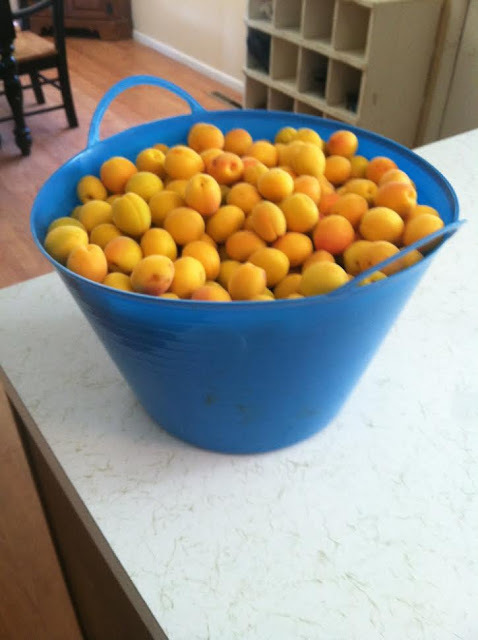 In my case this year, a couple friends of my friend had apricot trees with fruit they didn't want the trouble of harvesting. With gracious invitations, I had the opportunity to harvest apricots, not only once, but on three separate occasions this Summer. 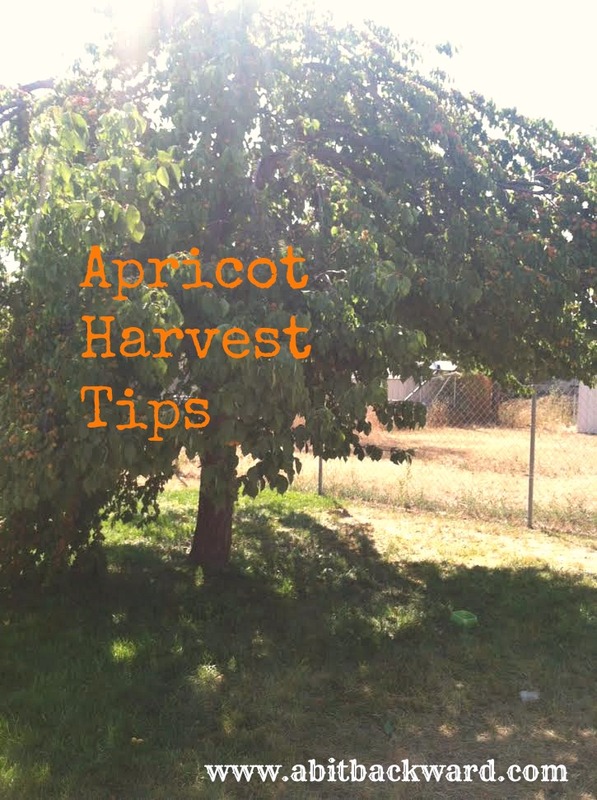 I thought I'd share the most helpful tips for making a pleasant apricot harvest experience with you today! Tip #1: Bring a couple friends! More people at any harvest means the spoils need to be divided, but the yield you can get by harvesting as a team is a notable advantage. Plus, time on a job passes so much more quickly and pleasantly when you're having fun! 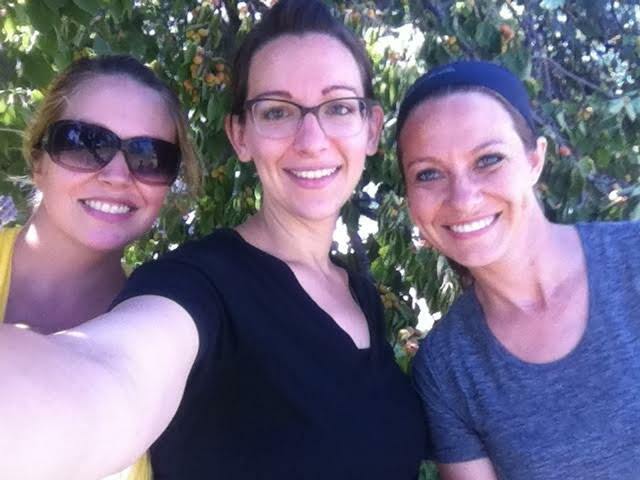 My friend Erin, Me, and my friend Heather. Tip #2: Bring a small free standing ladder, a long pole/stick, and/or a person who feels comfortable climbing trees. You don't necessarily need all three of these, but you will need at least one of them for a higher quantity and quality harvest as the fruit higher up and closer to the sun, ripens a bit faster than the fruit on the lower branches. 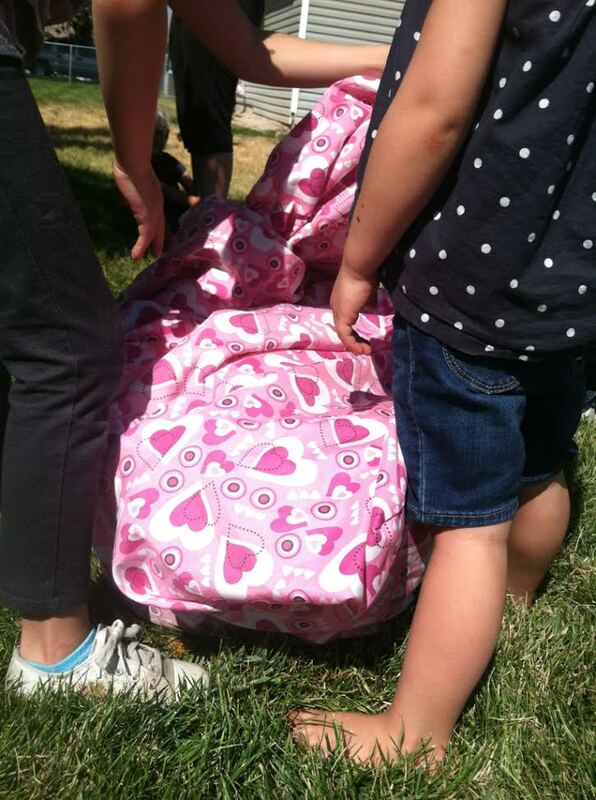 Tip #3: Bring a fitted sheet! 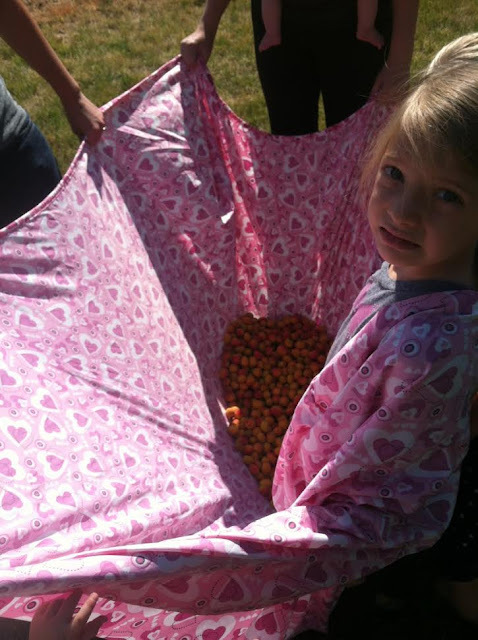 You can bring a flat sheet or blanket if that is all you have available, but the fitted is the most effective at capturing large amounts of fruit. Have the most agile and confident climber of your group climb the tree (or ladder if you brought one) and gently shake fruit-laden limbs with their hand, or a stick or pipe, as the rest of the group hold the fitted sheet below the branch being shaken. Don't shake limbs with apricots that aren't ripe. 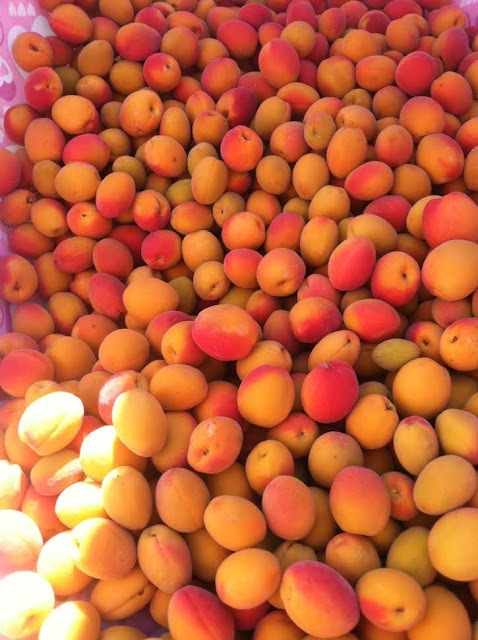 Apricots are much smaller and lighter than most other stone fruits and because of this, they don't bruise as easily as say a peach might upon hitting the ground or a suspended sheet. Because of this fact, I wouldn't recommend the shake and catch method for fruit harvesting with fruit bigger than apricots! 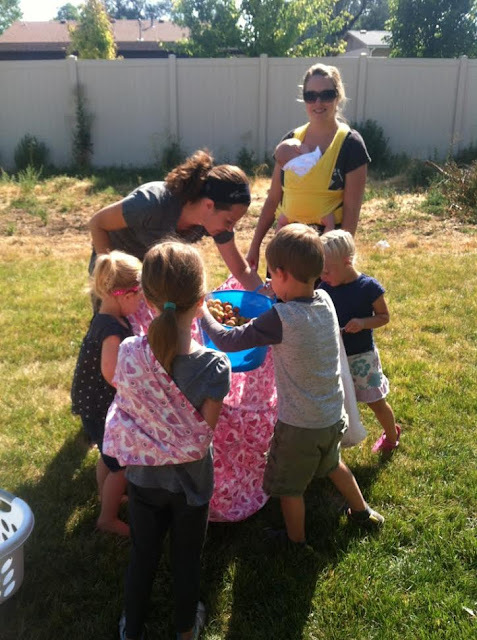 Tip #4: Bring buckets, boxes, or laundry baskets to store the fruit. This blue plastic bucket from the Dollar Store is a really great size for fruit harvesting, and it washes up easy, too. If you want to go a more environmentally-friendly/compost-able route, small cardboard boxes can do the trick as well. Just be careful to not stack the fruit too tall (No more than a foot and a half?) 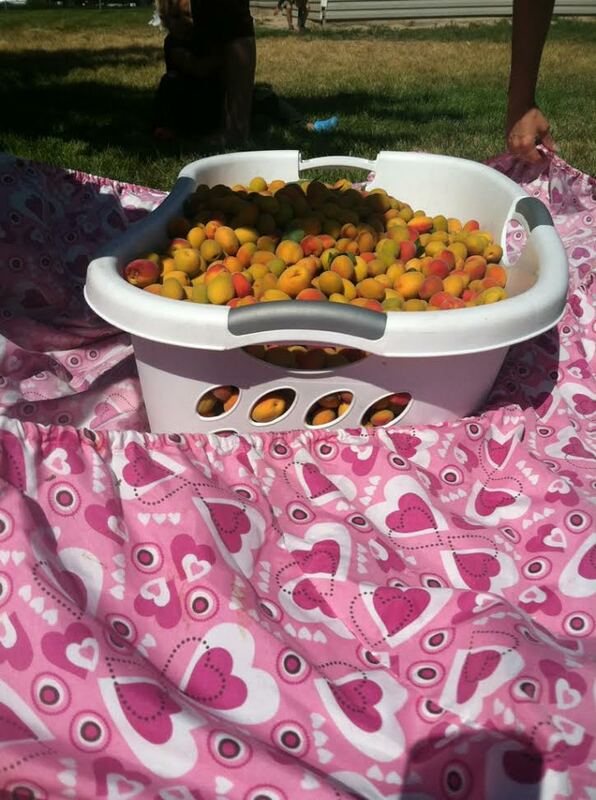 If the holes aren't too large on your laundry basket, that would also a great option for hauling a whole lot of fruit. When headed to the car, all you have to do is wrap it up in the fitted sheet to help keep in any tiny apricots that might slip out during transport. You'll want to transfer batches of fruit to these containers in batches as the sheet gets fuller and heavier. Tip #5: Enlist the help of your children. (If you have them!) They may not be able to work as efficiently, but by including them in these endeavors now, you insure future harvests will only continue to get easier as they learn to do their part. 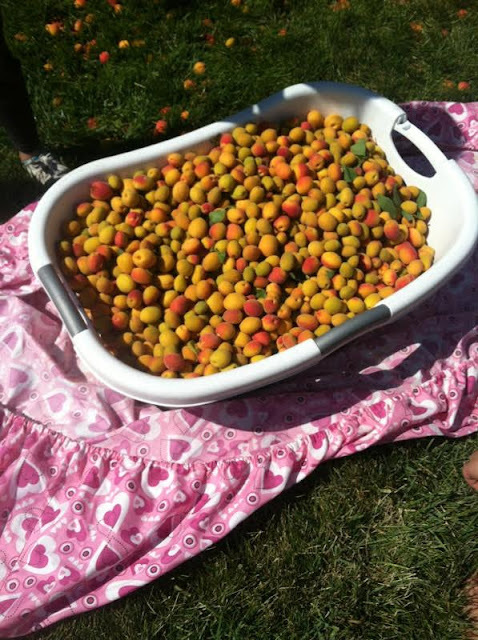 Also, with their shorter legs, it is a bit easier for them to watch as the apricots fall to the ground and toss them into the sheet if they didn't make it the first time. Bring extra grocery sacks for them to collect fruit throughout the process as well. It gives them something to do and contribute. Also, the great thing about harvesting fruit with kids is that snack time is built right in. If temperatures are very warm, you will definitely want to bring some water to accompany their snacking. Tip #7: Come dressed to work! Wear clothes you don't mind getting messy and you can comfortable move/climb in. You may also consider wearing a baseball cap to protect your head from falling apricots and face from UV rays. Not necessary, but a nice option. Tip #8: Give back. If you were able to harvest off of someone else's tree for free, make sure to bring some of the fresh picked fruit to the tree owner when you're done picking (or a jar of the finished, canned product) to say "Thank you!" There you have it! My top 8 tips for improving your apricot harvest. Now, what to do with all those apricots? 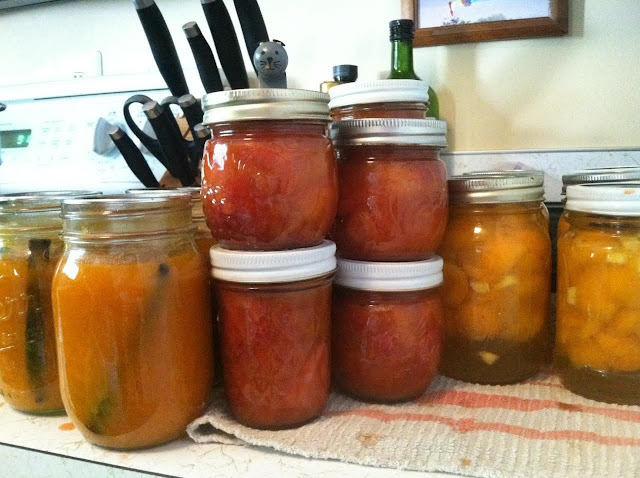 *A double batch of this made 11 pint jars. I just combined all the ingredients and boiled down not quite half until it was all combined, and the mixture felt thicker on stirring. (About 1 hour.) Process hot sterilized jars filled with the preserve and lidded with rings spun finger tight for 10 minutes in a water bath. Have you harvested fruit directly from fruit trees before? If so, what are your best tips? What are some of your favorite canning recipes? I was thinking to harvest apricot in my backyard but didn't have any idea how to do it and you just solved my problem in jiffy.